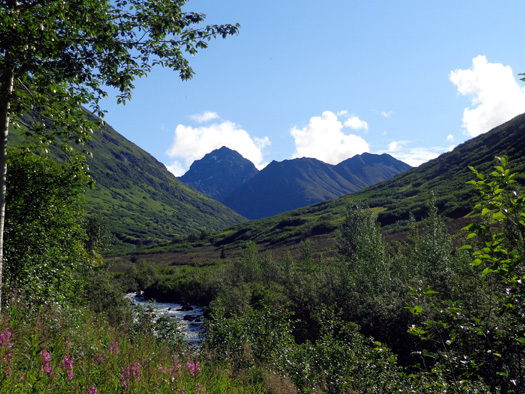 "The Gold Mint Trail follows the Little Susitna Valley to the end, below the Mint Glacier. 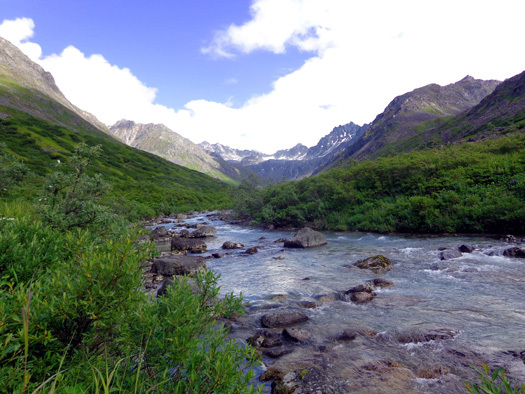 It traces the river's path on the west side for eight miles in the lush and scenic Gold Mint Valley. 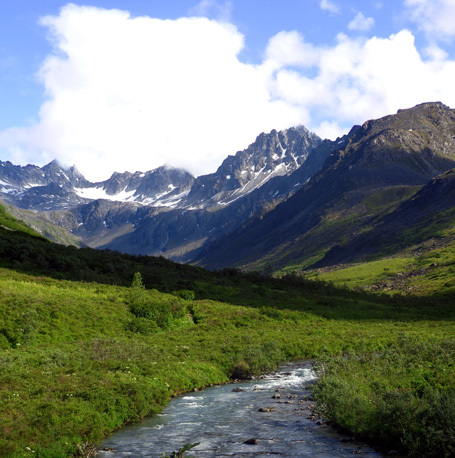 valley, with remnants of their past activity occasionally visible from the trail." No rain today -- we woke to sunshine again. It's probably the last day of sunshine we'll see in the next week so Jim and I both got outside a lot today. 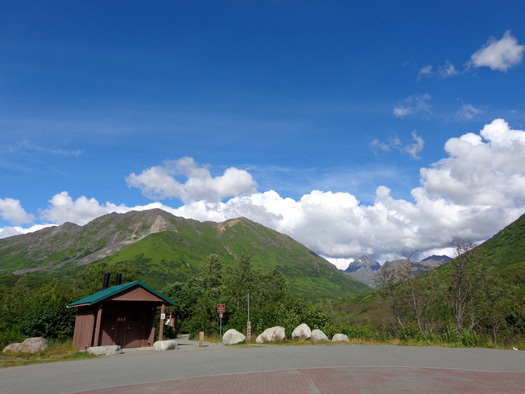 There is a restroom at the trailhead and signs with information about the route to Mint Glacier. The parking lot is large enough for big rigs to park and dry camping is allowed overnight. There were only a few vehicles in the parking area when I began and ended my hike. 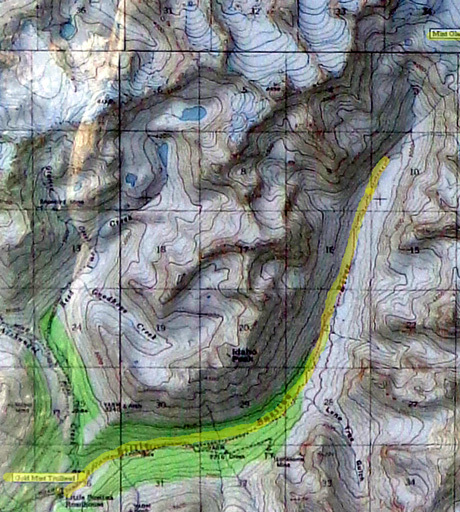 The trailhead is at the lower left of this map section and Mint Glacier is at the upper right. I marked the trail through the valley in yellow. Unfortunately, I can't show you an elevation profile, track, or map from my GPS. It took me over seven hours to do the hike. I took a gazillion photos (OK, 451 on the trail, to be exact), stopped several times to get in my pack, and talked to an Australian guy for several minutes. 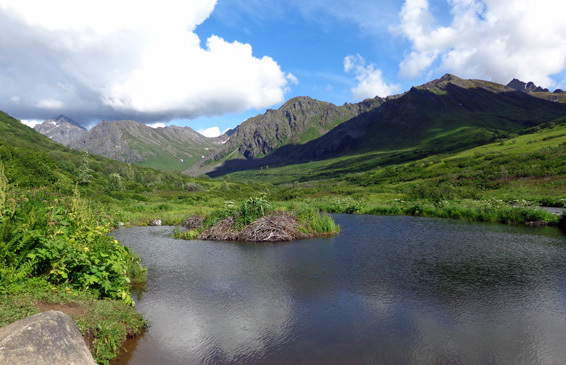 In addition, the trail was tough to negotiate in places � rocky, wet, overgrown with thick willows, lush flowers, and other plants. 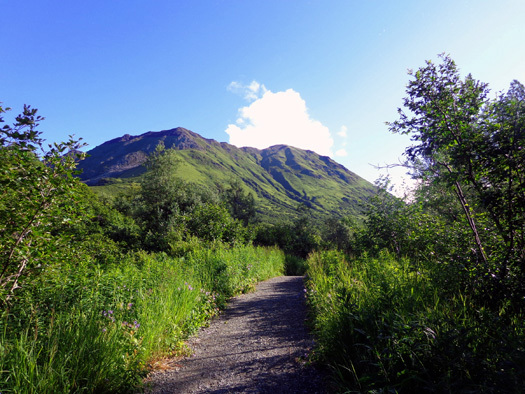 It is definitely easier to hike than to bike this trail, however, at least after five miles. 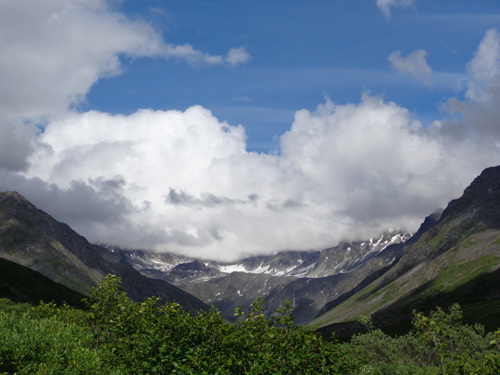 The best views of Mint Glacier are in the third and fourth miles of the trail. 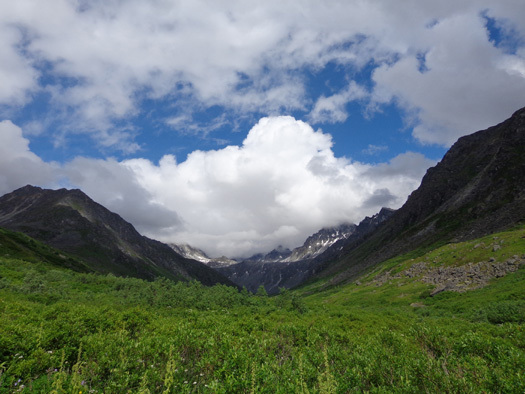 I was hoping to get all the way up to the hut (about eight miles) near Mint Glacier but stopped at seven miles because I was tired of pushing through the thick vegetation without being able to see where I was putting my feet. 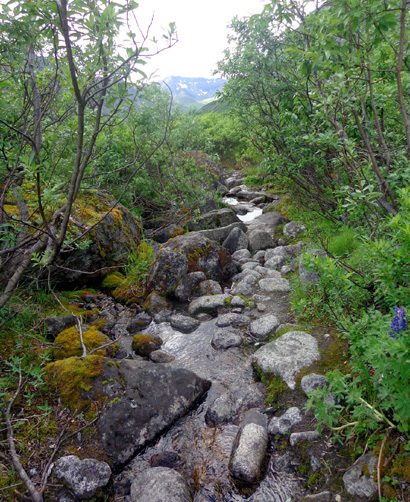 Sometimes the trail is a creek or goes through shallow wet areas. 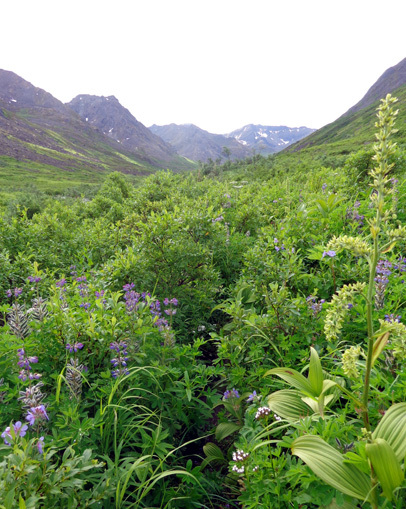 Lush vegetation, including these tall blue lupines, often hides the trail. 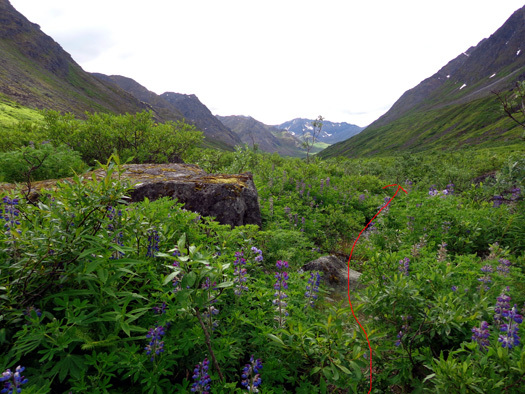 When I looked at my GPS track later I could see how close I got to the glacier area � tantalizing, but not close enough. 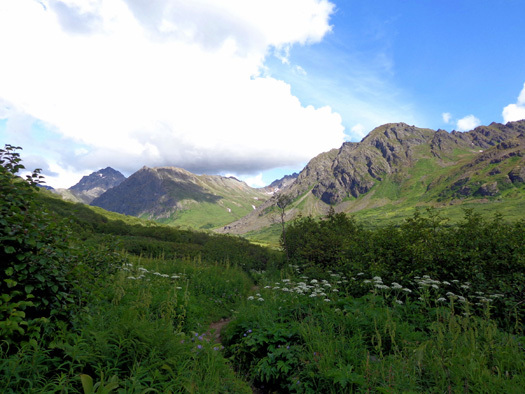 If I�d known that at the time, I would have pushed farther on the trail. This entry covers three pages because I want to show a lot of photos of this beautiful area. I edited those 451 original trail photos down to 345 pictures and chose 75 to showcase here. I'll divide them about equally so the pages are easier to load. The Gold Mint Trail is open to pedestrians, equestrians, and mountain bikers. 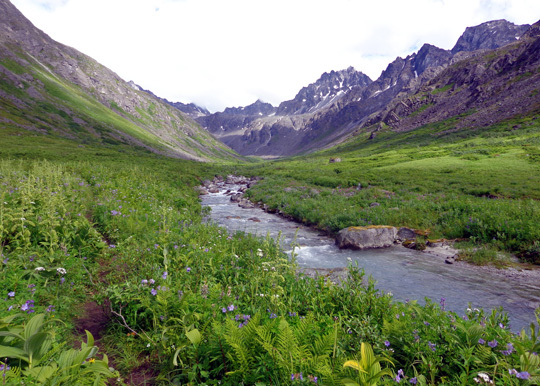 View from beginning of the trail of peaks I'd pass later in my hike; fireweed blooms in the foreground. Elevation at the trailhead is 1,815 feet. My high point, where I turned around, was 2,913 feet, a gain of 1,098 feet in seven miles. Most of that was very gradual. I�d probably notice any uphill sections more on a bike than on foot. Another cyclist, a middle-aged fella from Australia, came up from behind me about 2� miles in and we talked a little while. 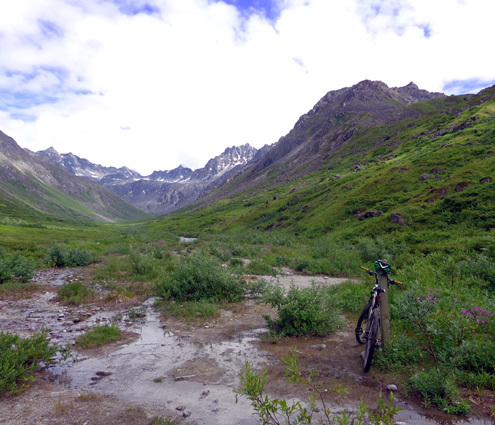 He planned to leave his bike wherever the trail got too gnarly to ride and walk farther from there. This trail gets increasingly difficult on a bike or on foot. He walked to about 6 miles and turned around. I saw him at about 5� miles, before he got back to his bike. 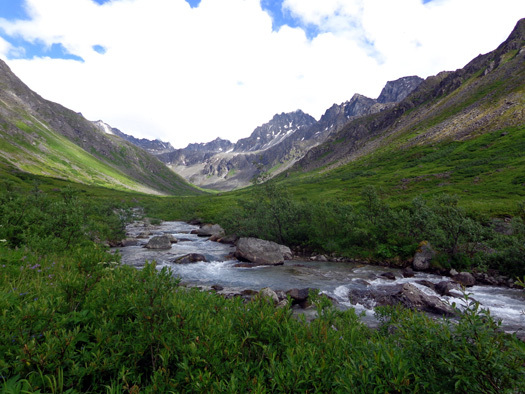 He warned me that the trail got harder and harder to negotiate through overgrown willows, more water and rocks, etc. He was right. There were about a dozen people closer to the trailhead when I came back. Otherwise, Cody and I pretty much had the place to ourselves all day. 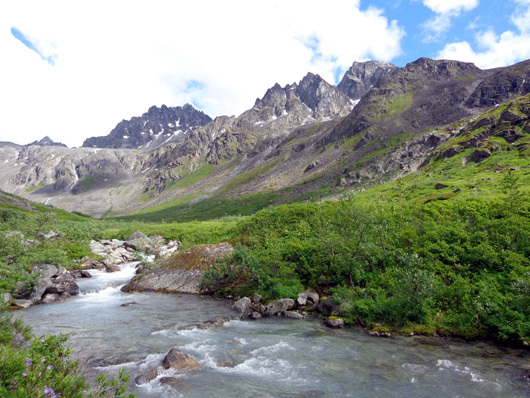 CRAZY PERSPECTIVE: IS THAT WATER FLOWING UPHILL? I've noticed an interesting phenomenon before and experienced it again today. The stream is coming from down in that valley, right?? I assure you it looked the same in person, not just in these pictures. AND WHERE DID THAT GLACIER GO? 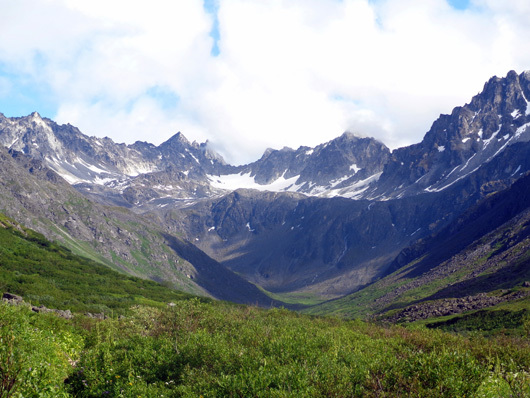 Another weird phenomenon in this valley is the disappearance of the Mint Glacier as you get closer to it. 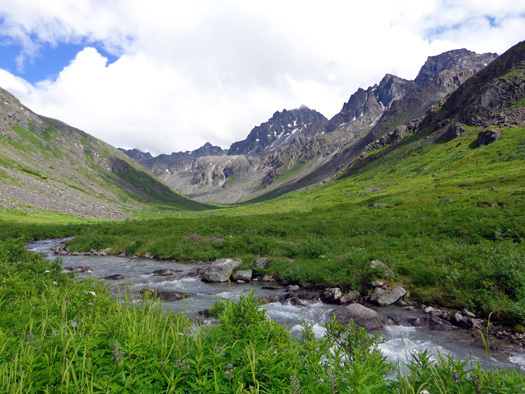 My best views of Mint Glacier were in the fourth mile on a few high spots in meadows where tall wildflowers and willows didn�t obstruct my view. You have to get back that far to be facing the right direction to see the part of the canyon where that glacier is located. 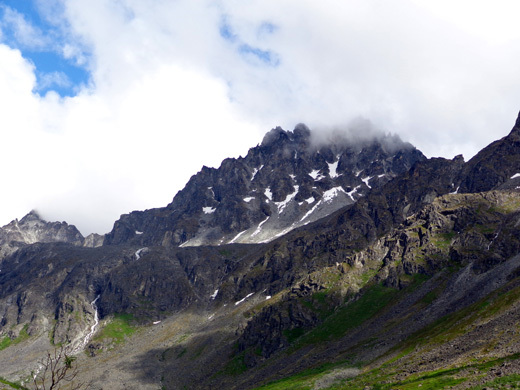 I couldn't see where the trail went as it got closer to the glacier, either. I've enlarged my 16-megapixel 16x close-ups of the end of the valley to their maximum resolution and can't tell where the trail or hut are located. I don't know if it's possible to get up to the ice or not. Guess I'll just have to keep walking farther next time to find out! This is about where I turned around at seven miles. I�m sorry I couldn�t get up to the basin at the edge of the glacier. I know it�s beautiful up there. 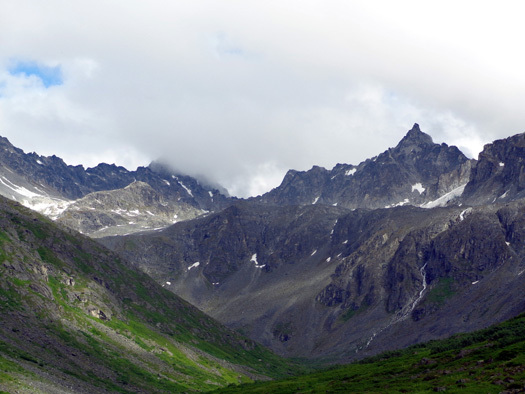 The peaks on either side of the river are in the 6,000-8,0000-foot range. Per my GPS map there are lots of glaciers on either side from 28 to771 acres in size. I could see some of them from the trail. Continued on the next page . . .